In this enduring story from a time not so long ago, Annie and her sister help Mama with washing the clothes on Monday morning. From gathering and sorting the clothes, to washing and hanging them outside to dry, to folding and putting them away, the family works together to get the job done. “First we work and then we play.” Mama smiles but walks with purpose to the porch. Tessa Blackham’s warm, hand-painted cut-paper collages bring the reader to a time in the Midwest when doing the laundry was an all-day family chore. For a preview of Tessa Blackham's illustrations click here. MaryAnn Sundby: As a child, she could be found tending to chores on her family’s farm. She went on to explore the wilds of Alaska, the oil fields of Texas, and the copper mines of Arizona. She returned to Colorado to write about her life’s journey and share it with readers. An avid adventurer and history buff, she writes stories that enhance understanding of heritage along with fostering hope and joy. This is her first picture book. For an in-depth profile of MaryAnn, click here. 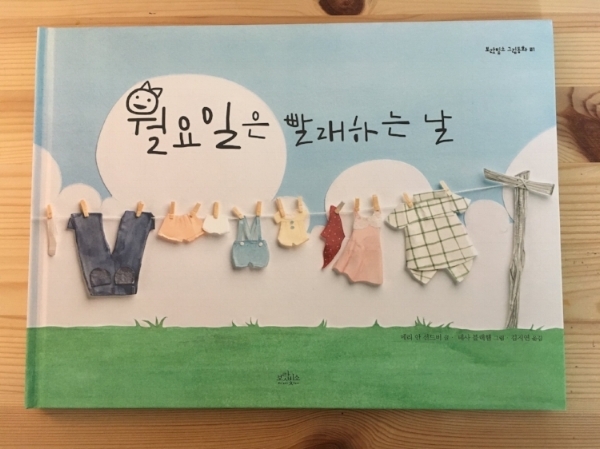 A delightful book that feels like playing paper dolls with extremely artistic friends, Monday Is Wash Day gives us a snapshot of daily life for Annie and her family. In a time before front-loaders and delicate cycles, before dry-cleaners and steamers, Annie and her sister pitch in—helping their mother fetch the water and turn the wringer, pour the bluing and hang the clothes out to dry. Proud of their hard work, the sisters look forward to playtime. First-time author MaryAnn Sundby shares her knowledge and enthusiasm for these simpler times. With a calm, descriptive and assured voice, Sundby’s storytelling underpins the “everything in its place” sentiment of the book. The sisters’ gentle teasing brings a comfortable depth to an uncluttered story, while their baby brother’s games add a playful tone. While Monday Is Wash Day tells a straightforward story, Tessa Blackham’s illustrations are far from simplistic. Beautifully drawn, Blackham’s cut-paper characters gracefully inhabit her paint-and-paper collage world, where no detail is forgotten. With a grandfather clock and hanging wall-portrait silhouettes, the rotary phone and kitchen curtains, soft colors bring us into a house that immediately feels like a home. Most astonishing is the tactile depth and movement on each page. With skillful manipulation, Blackham turns stiff paper into well-worn rugs and floaty dresses, wrinkly jeans and draped tablecloths. Clothes drying on the line nearly flutter in the breeze. 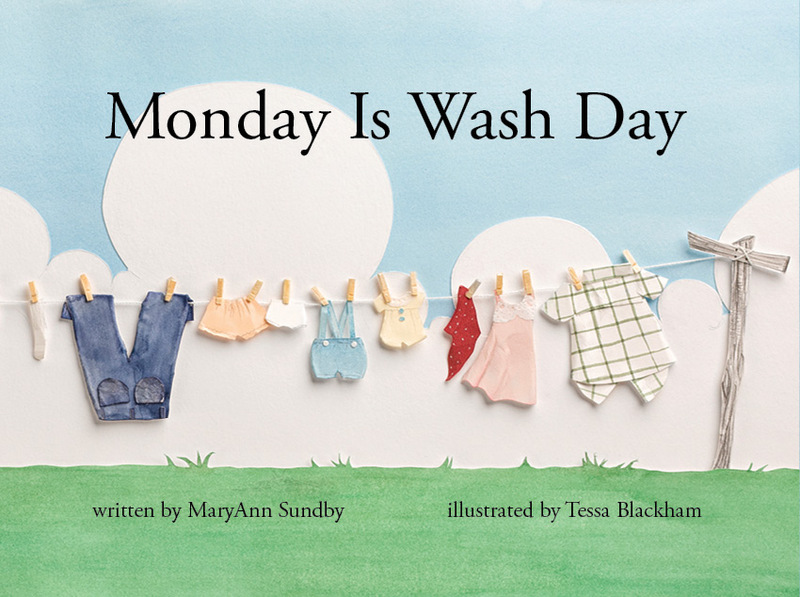 An original and deftly crafted story by MaryAnn Sundby that is charmingly illustrated by Tessa Blackham, "Monday Is Wash Day" is a wonderfully engaging and entertaining story from a time not so long ago. Annie and her sister help Mama with washing the clothes on Monday morning. From gathering and sorting the clothes, to washing and hanging them outside to dry, to folding and putting them away, the family works together to get the job done. "First we work and then we play." Mama smiles but walks with purpose to the porch. It's interesting to note that this is the debut artwork of Tessa Blackham whose warm, hand-painted cut-paper collages bring the reader to a time in the Midwest when doing the laundry was an all-day family chore. Unreservedly recommended for children ages 6 to 7, "Monday Is Wash Day" will prove to be a unique and enduringly popular addition to family, elementary school, and community library picture book collections. Two sisters help with the week’s laundry in an era when doing the wash required much more than the quick turn of a knob. “First we work and then we play,” says their mother. With a sigh, the girls cheerfully begin. Young readers might initially blanch. The dark-haired, light-skinned girls sort heaps of dirty clothes, haul buckets of water to the back porch (hot for the washer, cold for the rinse tubs), dump in soap, feed dripping garments through a wringer, rub their numb hands, and then hang the entire load on a line to dry with pins. Quickly, a fascination, appreciation, and perhaps even envy for this laborious weekly task will bloom inside modern children’s Oxy-cleaned chests. The girls find jokes, teasing, and closeness in their work alongside Mama—and just ahead of their stumbling baby brother. Will he help with the wash when he grows bigger? Cut-paper collages, in the soft colors of beloved faded clothes, bring dated domestic scenes into engaging immediacy with their clever crinkles, folds, layers, and gentle pencil work. Such carefully snipped and assembled artwork (wrinkled shirts, pleated dresses, tiny tea pots) conjures the magic found in the tenuousness of a precious paper-doll chain. A labor of love itself, this picture book delivers readers to an early time and leaves them feeling as warm and sun-kissed as a sheet fresh off the line. A young unnamed narrator describes helping her mother and sister, Annie, with the family’s weekly laundry chores at a time when crank-operated wringers and clotheslines were integral to the process. “First we work and then we play” is the family’s motto, but this story, the first children’s book for both Sundby and Blackham, is mostly concerned with the former. In exacting detail, the girl describes how she and Annie gather soiled items from around their farmhouse (a green early-20th-century oven sits in the kitchen, primly patterned wallpapers and white wainscoting line the walls), fill the washer and rinse tubs, and help wash and dry the linens (“Sheets and towels on the outside line. Shirts and blouses on the middle line”). Washes of pale color, delicate pencil detailing, and cut-paper collage elements create an expansive and inviting domestic backdrop, as Blackham uses wrinkled paper to evoke rumpled fabric and white string for clotheslines and apron ties. Beyond offering a glimpse of bygone household routines, the story is a quiet reminder of the pleasures of a job well done. This beautiful book was printed in Korean.